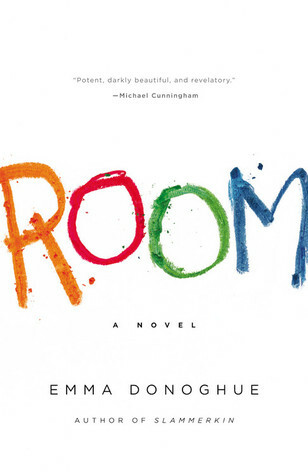 About Room by Emma Donoghue: To five-year-old Jack, Room is the entire world. It is where he was born and grew up; it's where he lives with his Ma as they learn and read and eat and sleep and play. At night, his Ma shuts him safely in the wardrobe, where he is meant to be asleep when Old Nick visits. Here's yet another book I held off on reading because of the hype. All I've heard are raves; it's gotten so many awards; it's now a movie. I also held off because based on the synopsis, was I ready? But I decided. It was time. And now I'm glad I did. This book is unlike any I have ever read. I disliked it from the beginning - the tedium, the child-like voice, the horrors. I remember wanting to stop but Jack's voice, his love for his mother, and his mother's ferocity were so compelling, I couldn't stop until I found out what happened to them. I wanted to know that they would be ok. This is extremely tense reading. Horrors are revealed in unlikely ways as Jack narrates his day to day. The days roll on and it seems like nothing changes. Repeated names of Things, like Room, capitalized, as this was the only world that Jack knew. Routines being explained from a 5-year-old viewpoint, with five-year-old language. I couldn't help getting absorbed in getting to know Jack and his Ma. But descriptions of Old Nick made my skin crawl. The simple horror of the situation with the child's voice really messes with your head -- a psychological journey for a reader. There is nothing pleasant about reading this book. Nothing. But what kept me going was the hope and the palpable love of mother for child, a love that never allowed hope to die. Verdict: One of the most difficult books I've ever read. If you don't flinch at difficult subject matter, the first person, five-year-old voice in which this story was told will surely make you weep. Highly recommended.